The Tamworth Herald is 150 years old today and is publishing a special edition tomorrow to mark the anniversary of its first publication on 8 August 1868. The newspaper covers news across Tamworth, and in many parts of south Staffordshire and North Warwickshire. When I was struggling to become a freelance journalist around 1970-1971, the Tamworth Herald published some of my early features. Sadly, my cuttings have gone missing in the intervening years, and no longer have a record of these contributions. However, I contributed more frequently to the Lichfield Mercury, and then moved on to the Wexford People and The Irish Times. But I continue to hold an affection for the Tamworth Herald. The Tamworth Herald was founded as a broadsheet in 1868 by Daniel Addison, a local newsagent, bookseller and stationer, and its first offices were in Silver Street, Tamworth. A ‘flyer’ introducing the weekly Tamworth Herald advertised the new weekly newspaper for Tamworth, with coverage of surrounding districts, including Fazeley, Wilnecote, Glascote, Bolehall, Polesworth, Austrey, Newton Regis, Clifton Campville, Hopwas, Hints, Wigginton and Elford. The Herald came on the market as parliamentary election fever was beginning to take a grip on the town. The front page carried a letter from one of the three candidates, Sur Henry Lytten Bulwer (1801-1872); two seats were at stake, and the other candidates were Sir Robert Peel (1822-1895) and John Peel (1804-1872). John Peel lost his seat and Bulwer and Robert Peel were elected. But when Bulwer was elevated to the peerage as Lord Dalling in 1871, John Peel was elected unopposed in his place, and held the seat until his death in April 1872. A major news story in the first edition involved a fire destroying many acres of gorse and heather in Sutton Park. The news that trees and bushes were ablaze in this favourite picnic spot attracted visitors in their thousands, and the large number of spectators made the scene resemble a racecourse, the Herald reported. Addison continued publishing the Tamworth Herald until 29 October 1877, when it was taken over by a consortium of leading business figures in the town. The Herald moved its printing operations to a new site near the Progressive Club in Halford Street in 1899. The building on the corner of Silver Street was given a picturesque mock-Tudor makeover in 1928, and ground floor shop in Silver Street was the premises of Burdett’s shoe shop for many years. The mock Tudor shop remains one of the prettiest buildings in Tamworth. In 1965, the Herald moved to new premises in Aldergate in 1965, and more recently moved to Ventura Park in 1996. The Herald was named ‘Newspaper of the Year’ at the Midland Media Awards in 2015 and 2016. The judges in 2016 praised the newspaper as ‘never failing to impress’ with its mixture of exclusives, original local journalism and great imagery. Over the years, two columnists or journalists, Mabel Swift and John Harper, have paid particular attention to local history in the Tamworth Herald. 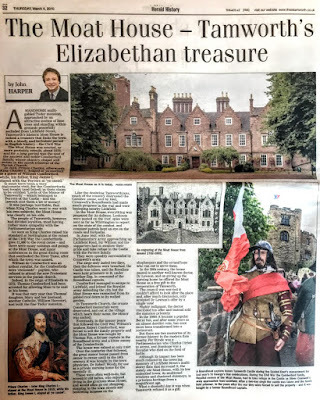 For example, on 4 March 2010, John Harper published a full-page history feature on the Moat House, the Comberford family’s Elizabethan manor house on Lichfield Street. His research has also been published as a book, Tamworth Past and Present (Derby: Breedon, 2002, republished 2008 and 2012), with many of the photographs by the Herald photographers Paul Barber and John Walker. 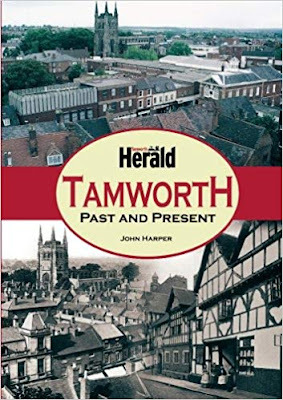 In this book, he gives a vivid insight into the dramatic developments that have taken place in Tamworth in recent years, recalling streets, houses and public buildings, shops, businesses and pubs that have vanished or been altered almost beyond recognition. John Harper also edited Mabel Swift’s columns which were published as a book in 2006, A Swift look round at Tamworth History. Her research reflected a particular interest in the role of the Comberford family in the Civil War conflicts in 17th century Tamworth and Lichfield, when she says Cromwellian forces mutilated the Comberford monument in Saint Editha’s Church, Tamworth, defaced the Comberford Chapel, and, sacked Comberford Hall. One chapter in her book is devoted to the Moat House, the Comberford family Tudor-era house on Lichfield Street, which continues to feature in news reports in the Tamworth Herald. 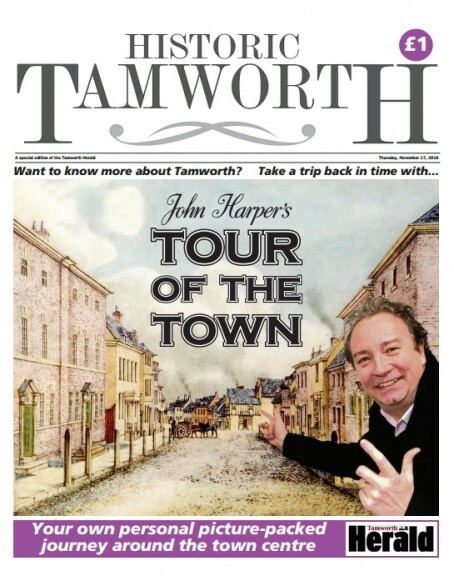 Two years ago, the Tamworth Herald produced a 64-page guided tour by John Harper of the town as a special edition of its occasional Historic Tamworth series. The guide looked at 50 sites around the town centre and was designed for readers to carry with them as they explore landmarks including Tamworth’s Norman castle and a town centre café that was a haunt of Mick Jagger in the 1960s. Until the early 2000s, the Herald was published on Fridays, but it is now published on Thursdays. Today, the Tamworth Herald is a weekly tabloid newspaper, published every Thursday, with a cover price of £1. Its offices are at Ventura Park Road, Bitterscote, and Gary Phelps is the editor. Three editions of the paper are published each week – one for Tamworth, and an edition each for Coleshill and Atherstone. In 2016, the average weekly circulation was 11,333 copies across the Tamworth Herald, Atherstone Herald and Coleshill Herald titles. The Herald is owned by Reach plc, previously Trinity Mirror, which owns the Daily Mirror and many newspaper titles in the Midlands, including the Lichfield Mercury, which was established in 1815, the Sutton Coldfield Observer, the Birmingham Post and the Birmingham Mail. Sounds really good, i wish you would do the same for Polesworth.